Domaine Comte de Lauze is a relatively new property in the Southern Rhone Valley as the estate was founded in 1976. Domaine Comte de Lauze owns 10 hectares of vines in the Chateauneuf du Pape appellation. 9 hectares are used for growing grapes used in the production of red wine and one hectare on their cooler terroir is reserved for the production of white Chateauneuf du Pape wine. The terroir is clay with limestone with small stones and rocks in the soil. 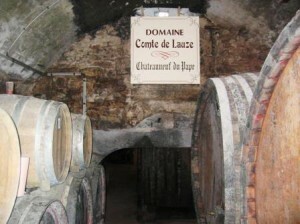 Domaine Comte de Lauze produces 2 red Chateauneuf du Pape wines and 1 white Chateauneuf du Pape wine. Domaine Comte de Lauze Chateauneuf du Pape is made from a blend of 80% Grenache, 10% Syrah and 10% Cinsault. The grapes come from vines that are on average close to 45 years of age. The wine is aged for 12 months in foudres. The production is close to 1,250 cases per vintage. Domaine Comte de Lauze Chateauneuf du Pape Reserve de Comtesse is produced from a blend of 80% Grenache and 42% Syrah. The Grenache comes from the estates oldest vines that are on average 60 years of age. The terroir is nothing but rocks and stones in the Cabrieres vineyard. Vinification takes place in traditional cement vats. For the aging of the wine, the Grenache aged for 12 months in foudres for 12 months. The Syrah is aged in used, French oak barrels. The production is about 500 cases per year. Domaine Comte de Lauze Chateauneuf du Pape Blanc made its debut with the 2009 vintage. The wine is produced from a blend of 45% Grenache Blanc, 35% Roussanne, 10% Clairette and 10% Bourboulenc. Domaine Comte de Lauze can be enjoyed on the young side. Young vintages can be popped and poured, or decanted for about 1 hour, give or take. This allows the wine to soften and open its perfume. Older vintages might need very little decanting, just enough to remove the sediment. Domaine Comte de Lauze is usually better with 2-4 years of bottle age. Of course that can vary slightly, depending on the vintage. In the best vintages the wine should be consumed within 3-10 years after the vintage. Domaine Comte de Lauze is best served at 15.5 degrees Celsius, 60 degrees Fahrenheit. The cool, almost cellar temperature gives the wine more freshness and lift. Domaine Comte de Lauze is best served with all types of classic meat dishes, veal, pork, beef, lamb, duck, game, roast chicken, roasted, braised, stewed dishes, sausage, barbecue and cassoulet. Domaine Comte de Lauze is also good with Asian dishes, hearty fish courses like tuna, mushrooms, pasta, eggplant, tomatoes and cheese. The white wine of Domaine Comte de Lauze is best served with a myriad of different seafood dishes, shellfish, crab, lobster, sushi, sashimi, chicken, pork and veal, as well as Asian cuisine. Domaine Comte de Lauze also produces red, white and rose’ wine in the Cotes du Rhone appellation from 15 hectares of vines. Flowers, cherries and thyme are what you find first. On the palate the medium/full bodied wine is soft, round, rich, deep and inviting, with freshness and ripe fruits galore. The wine is made from blending 60% Grenache with 40% Syrah. This is the best wine ever produced by Comte de Lauze! Medium bodied, with spicy peppery fruits, elegant textures, freshness and sweetness, this charmer is ready when you are. You can easily enjoy this on release. The wine was made from blending 80% Grenache with 20% Syrah. Medium bodied, soft, polished and forward, this will clearly be best in its easy drinking, red berry dominated, soft youth. Medium bodied, easy drinking, forward style of Southern Rhone with peppery, kirsch notes. Medium bodied, with good sweetness in its spicy fruits, drink this forward, round, fresh wine young. The wine was produced from a blend of 80% Grenache and 20% Syrah. Medium bodied, spicy, fresh and serving up a tasty blast of sweet, peppery, black raspberry notes in the finish. Light, bright, and offering simple, red berries, garrigue, and a tart finish. Spicy, herb and red berries with a drying cherry finish. Light in color, this medium bodied wine offers a charming, delicate smokey, cherry, herb and thyme character with a soft, easy drinking, red cherry finish.